The Summer Solstice marks the start of what many Canadians refer to as “Patio Season”. As the long days begin to warm up, people reach for the lighter brews and these releases certainly reflect that. 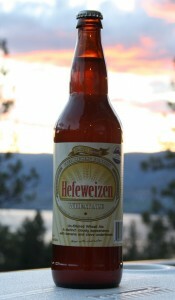 Tree Brewing’s Hefeweizen, crafted by the German Braumeister Stefan Buhl, won a gold medal at the 2010 Canadian Brewing Awards. Individual bottles are already sold out at the brewery, so you’ll have to check the Private stores or pick up a Summer Character Pack with the Hefeweizen, Kelowna Pilsner, Thirsty Beaver Amber and new Beach Blonde Lager. There’s a couple of refreshing fruit beers now available: Whistler Brewing’s Paradise Valley Grapefruit Ale and Granville Island’s False Creek Raspberry Ale. For a little warmth in the cooler evenings, Driftwood Brewing has released a new batch of their Belle Royale Strong Cherry Belgian Ale. Pacific Western Brewing has just launched their new Cariboo Pale Ale. It’s 5.5% abv, finished with Cascade hops, and lists at only $7.99 for a 6-pack of cans! The AFIC Group has brought in some Hop in the Dark Cascadian Dark Ale from Deschutes. There’s currently only 10 cases in B.C., with more to come in July. After some trouble with the law (concerning the original name ‘No Jail Pale Ale’), Cannery’s No Justice Pale Ale has finally hit the shelves. At only 3%, you can drink the bomber without getting bombed. Granville Island Brewing recently bottled their Limited Release Imperial IPA. Available at their retail store, and should be in select LDB stores soon. Great Western Brewing is releasing the Original 16 Canadian Pale Ale to honour the “employees who saved this regional brewer from the wrecking ball more than 20 years ago”. There’s a bunch of news from Tree Brewing. They’ve ditched the industry standard twist-off for an attractive new bottle and open 6-pack design. The Thirsty Beaver Amber Ale, Cut Throat Pale Ale, and Hop Head IPA are already on the shelves, and the Kelowna Pilsner will be joining them soon. Tree’s Beach Blonde Lager is now canned and available in 6-packs, which will be great for the summer. And finally, Tree just bottled their Captivator Doppelbock. Stefan Buhl is the German Braumeister behind this malty delight that won Gold at the 2010 Canadian Brewing Awards. 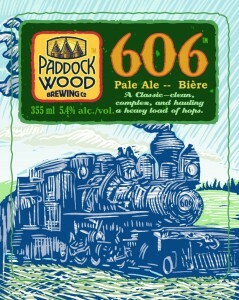 Paddock Wood, Saskatchewan’s first craft brewery, is entering the Ontario market with two of their brands: 606 India Pale Ale and Czech Mate Pilsner. But the tale of how and where the brands are available is an interesting one, and not the usual way a new brand arrives in Ontario. Earlier in the year Paddock Wood pursued a general listing in the LCBO (meaning the beer would be available all the time, not just as a seasonal release) and also a listing at The Beer Store. What ended up happening is that Paddock Wood was approved for LCBO “Combination” stores – which are stores in rural communities where there is no Beer Store – not regular LCBO stores. 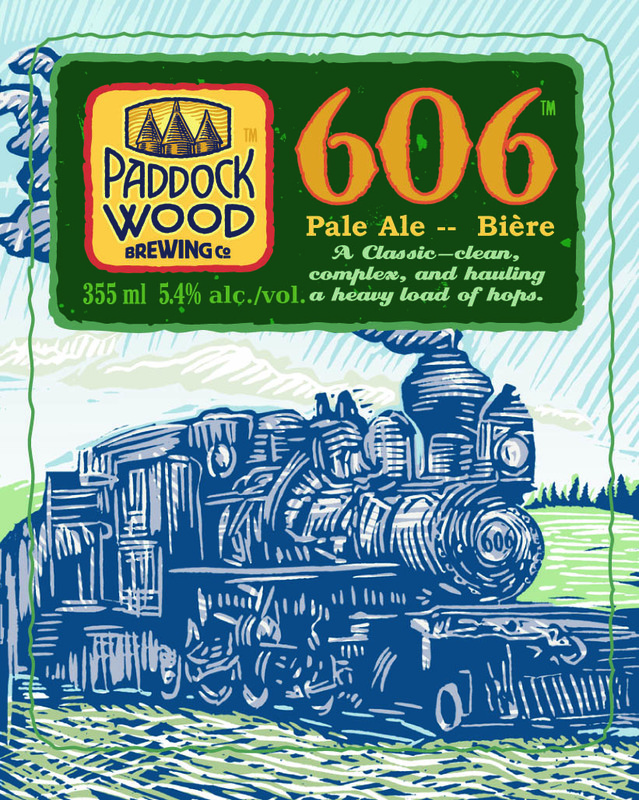 So, regular LCBO stores will not be getting Paddock Wood, but the combination ones can do so (according to the LCBO’s inventory, the 606 IPA is available in Paisley, ON). Believing that regular LCBOs in Toronto would be able to get Paddock Wood (before the “Combination” clarification), the brewery did not list in any Beer Stores in the city. Which is why, at this point in time, you will only be finding Paddock Wood at select Beer Stores or LCBO combination stores outside of Toronto. This is probably the first time a craft brand has hit the province and it is not in Toronto! But this is going to be changing quickly. Paddock Wood will be listing in about 20-25 more Beer Stores, including Toronto. So beer fans in Toronto, you’ll be able to get it soon enough if you don’t want to take a drive to pick some up. Both 606 IPA and Czech Mate will be sold for $13.20 per six pack. The 606, named after the 606 jazz club in London, originally began as Paddock Wood’s Rye IPA, but lowered its alcohol percentage at the request of bars in Saskatchewan to 5.4%. Over the last couple of years the hops in 606 have changed but presently it’s hopped with Cascade and Amarillo. 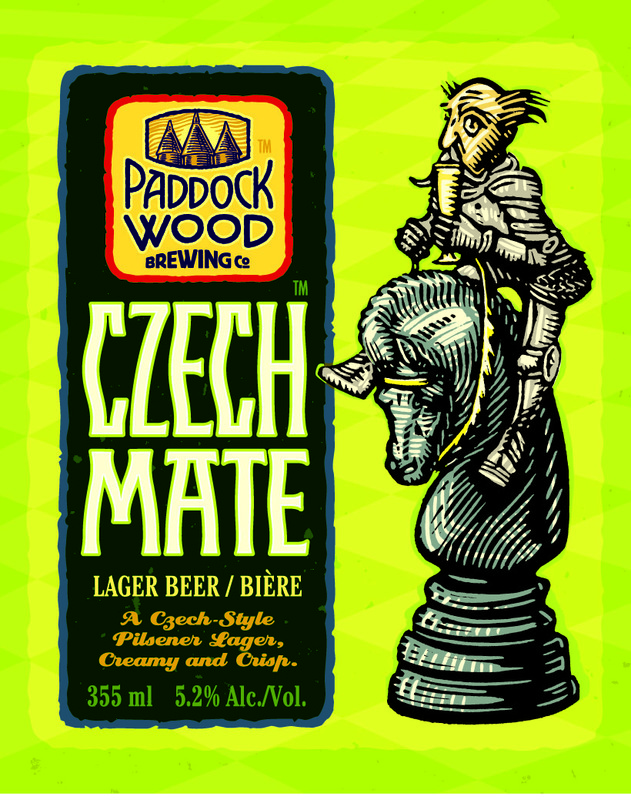 Czech Mate was driven by Paddock Wood’s brewmaster’s (Steve Cavan) challenges finding fresh Czech-style pilsners in Saskatchewan when he was a homebrewer – so he did something about it! 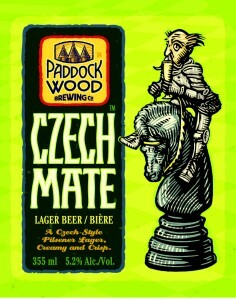 This brought about the opening of Paddock Wood so Steve could get the ingredients and make the pilsner he wanted to and so Czech Mate was born. Currently both brands will be available (if not already) at the following Beer Stores: Kitchener (Bleams Road), Oshawa (Taunton Road E), Peterborough (Landsdowne), Georgetown, Orangeville, Barrie (Bayfield St), Brampton (Bramalea City Centre), Ajax, Lindsay, Guelph (Willow West Mall) and Aurora. For many years it has been unfortunate to not have access to many Canadian craft beers in Ontario. The founder of Paddock Wood, Steve Cavan, is originally from Ontario and it is great to see some new Canadian craft brands in the province. Welcome Steve & Paddock Wood! New to the import selection at The Beer Store is Desperados, a 5.9% lager from France’s Fischer that is flavoured with tequila. This unique beverage has previously been available at a couple of bars in Toronto, but this is the first time it has been available for retail purchase. Desperados is available now in 300 ml bottles being sold in units of 3 ($6.50) and 24 ($52.00). Niagara’s Best Lager is a Canadian style lager with a sweet malt character and a smooth clean finish. This product contains 5.5% alcohol by volume and is lightly hopped to appeal to the tastes of the mainstream beer drinker. This beer seems to represent an attempt by Niagara’s Best to grab a slice of the lucrative but increasingly crowded buck-a-beer market, as it’s currently available only in cases of 24 bottles priced at $26.40 including deposit. Chambly Noire is new to Ontario.